Documentary filmmaker Alex Gibney (“Enron:The Smartest Guys In The Room”, the Oscar-winning “Taxi To The Dark Side”, “Gonzo: The Life And Work Of Dr. Hunter S. Thompson” among many others) set out to tell the story of Lance Armstrong’s 2009 comeback to the Tour de France as an unmatched 7-time winner. Combining Gibney’s unprecedented access to Lance and the team, the numerous interviews with those that raced with and otherwise knew Lance, and an adroit use of historical footage makes for a fascinating movie. Oh, but how far the mighty can fall. Within the first fifteen minutes you are drawn in as Gibney deftly crafts his story. The prescience, the foreshadowing are incredibly powerful. Lance has a force of personality that only a few possess, and they are not all very nice. Showing the Oprah interview of Armstrong very early on, after a litany of great moments in his career, sets the stage for the following relentless denials and lies. The sabotaging of careers and repeated lawsuits, an almost wondrous breadth of actions to protect the franchise by both Lance and his many benefactors and sponsors, just the constant deluge of denials by Lance is astounding. There were hundreds of millions of dollars for the sport and its sponsors dependent on the Lance story, and he had a lot of support. The interviews are the best part, especially the ones with the Andreu’s and long-term teammate George Hincapie. They are among the most honest and raw moments in the film. Betsy Andreu in particular comes across as a very strong and honest person. Hincapie talking about how they started EPO back in the mid-nineties, Landis acknowledging the Lance is a liar, even Lance’s “I’m sorry you can’t believe in miracles…” speech from the final podium of the 2005 Tour all resonate. Our sport has a history, and it is not clean. Personally I choose to believe that it is cleaner now, but I know it wasn’t for a long, long time. Gibney shelved his film after the serious allegations came out, including the “Reasoned Decision” from USADA. He came back to it shortly before the Oprah interview. Over the years he worked on it he has come to understand many things about our beautiful sport, its history, its characters, even its intricacies of teamwork and collusion. This knowledge shows through as he tells this story. Like in how he keeps going back to Dr. Michelle Ferrari for interviews, whom Lance had personally bought into his inner circle at a great cost, thus keeping Ferrari from working with any competitors. He gives the full background of Ferrari, his knowledge, passion for cycling, and legal difficulties over doping. And how Lance kept working with him through his son Stefano through 2009. The latter part covers much of the comeback, with flashbacks interspersed to relevant times. It goes deeper into the relationship between the UCI and Lance. About conversations and payments between Lance, Johan Bruyneel, and both UCI leaders Hein Verbruggen and Pat McQuaid. It also covers the racing, including his struggles in the Giro and the Tour. Lance finished third, a great result after four years out of the sport. Yet, the 2004 Simeoni incident alone shows an arrogance that is shattering. Lance is Lance. He grew our sport by great leaps and bounds. My first cycling hero, Greg Lemond, took the first big steps to bringing real money into cycling. Lance stepped it up. We owe him that, getting so many others onto bikes and letting them feel the freedom of riding in the wind. The lies? I really don’t know. It takes a strong person to survive even at the RMR Criterium. I am looking to the future, to see if the “Cycling Independent Reform Commission” really lets those coming into our beautiful sport at the top levels do it without having to dope. If the whole Lance saga results in true reform I would consider that his biggest victory. This is an excellent documentary, especially for those of us interested in the recent history of professional cycling and the downfall one of its greatest purported champions’. Highly recommended. 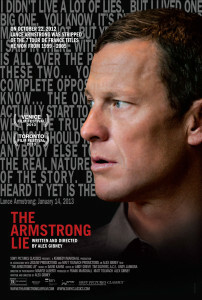 In 2009, Academy Award®-winning director Alex Gibney (2007, Best Documentary, Taxi to the Dark Side) was hired to make a film about Lance Armstrong’s comeback to cycling. The project was shelved when the doping scandal erupted, and re-opened after Armstrong’s confession. THE ARMSTRONG LIE picks up in 2013 after Armstrong was stripped of his 7 Tour de France titles, and presents a riveting, insider’s view of the unraveling of the greatest deception in sports history.